Amazon Kindle is a product which has influenced many people, changed the way people read books (maybe with a cup of coffee? ), but now the Kindle experience will go even better with the new Kindle Oasis. The Kindle Oasis is completely a blast in terms of what it packs and what are the features. For the first time ever, in the last ten years since Amazon has been moving on with Kindle and making them better, they have made the Kindle Oasis waterproof with IPX8 rating, so don’t worry if you accidentally drop some coffee or tea over it. Not just that, the new Kindle Oasis is bigger with a bump in display size, now it holds a 7-inch 300 ppi display moving on from the 6-inch as we had seen last year. The magnetic battery extension case is gone. The new Kindle Oasis relies entirely on its built-in battery. The design is kinda same, but Amazon has put a bigger battery inside and they said in the press release, “The all-new Kindle Oasis has a battery life measured in weeks, not hours—and it includes a fast-charging capability that allows it to go from no battery to fully-charged in less than two hours.” It has a similar physical design, with one thicker side that tapers down on the other side, for one-handed reading. The resolution of the e-paper display is the same at 300 ppi, but it packs some more extra LED for a brighter and even-looking display. The Oasis also packs an ambient light sensor that adjusts the brightness as you keep reading and moving with it, across different lighting conditions. It also comes with both page buttons and also has the option accessible via the touchscreen. Now, the new Kindle Oasis is waterproof and has been tested in up to two meters of water for up to 60 minutes. Amazon says that they have tested it in different water environments. The new Kindle Oasis comes with the built-in Audible app, but Kindle has no speaker, right? Well, you can just start an audiobook and stream it over Bluetooth to a set of headphones or a speaker. 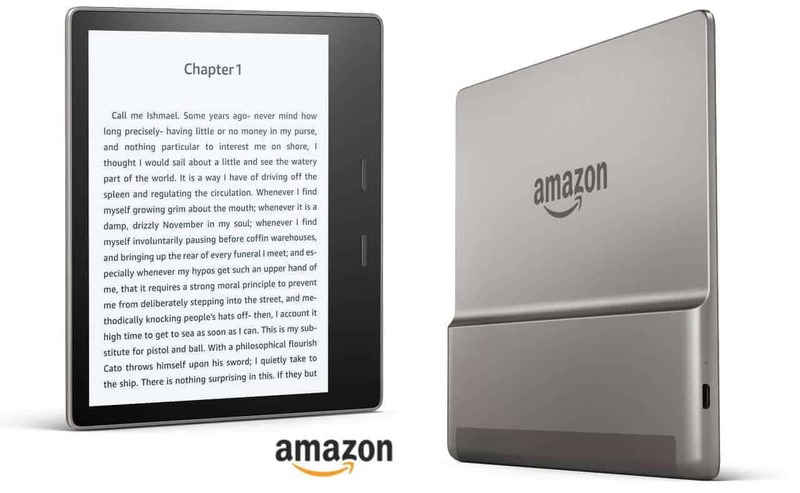 The new Kindle comes in two storage variants- 8GB and 32GB and is now available for pre-order on Amazon. Previous articleFinally we have an outdoor AC that does some other cool jobs as well! Next articleAsus ZenFone AR – The Future-ready Smartphone to Explore the Virtual World!